For any young person who is excited about sea life, this book looks pretty awesome. The book is sturdy and spiral bound and would be exceedingly difficult to tear apart. It comes with a wooden stylus pen for creating your chosen designs on the alternating pages of black paper. Each page spread consists of one page of information on a specific sea creature and one page of black-coated gold, silver and colored glitter pages. The idea is you use your stylus to scratch the black coating off, thus creating a design of your choice on the paper. You can use the simple pattern provided on the opposing page to create a sea animal or you can make your own designs. There are a total of 20 sea creature drawings with information about each one. There are also an additional 20 "plain" pages for "free style" drawing. By that I mean that there are twenty extra pages of non coated paper for you to use a regular pen or crayons on. This is a fun little book that is a little different from art books you might usually see. I've spotted this series of Scratch and Sketch books around various stores but hadn't picked one up until recently to check it out. Published by Peter Pauper Press there are a number of titles to choose from including: Wild Safari , Solar System , Fine Art , and Butterflies and Friends . Since we adore all things that live in the sea around these parts, I'm excited to share this book with Bookworm1. I like the fact that it's unique and out-of-the-ordinary. As Bookworm1 would say, it's "th-pessal"! That's just the way we like our art to be! 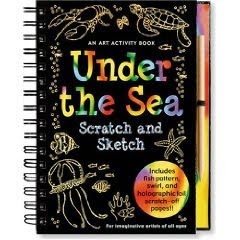 If you'd like some additional information on these books, Jennifer wrote a review of the Scratch and Sketch Activity books over at 5 Minutes for Books. You can check out her opinion of them as well!